My British list isn't very big. Under 300 – I won't say anymore than that. 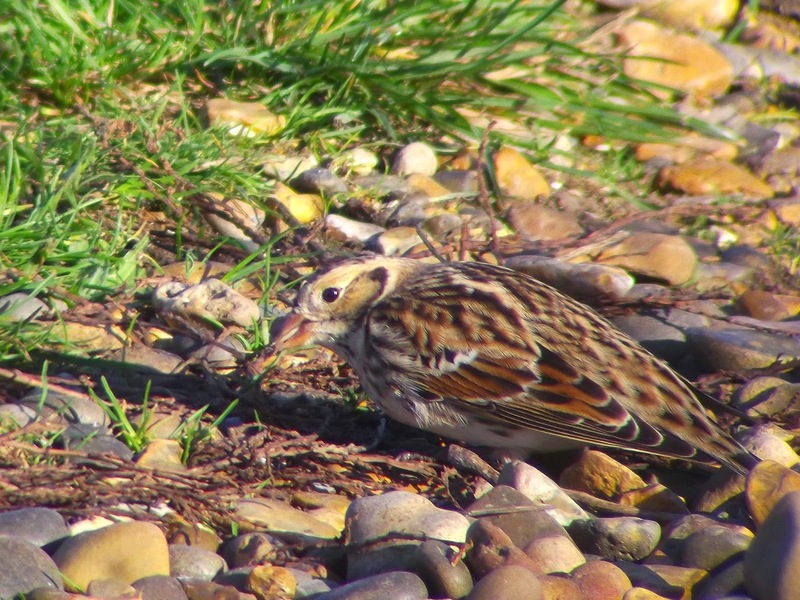 I've seen plenty of rare birds over the past few years, and have travelled plenty of miles to see some of them. Having said that, I'm aware I'm not a long-distance twitcher. I just haven't the energy or enthusiasm to drive for more than three hours to get somewhere to see a bird. If it takes more than a couple of hours I start to question my sanity. Then again, it depends what bird it is. I seriously considered going for the Masked Shrike at Spurn, but left it too late. On another day I may have made the effort to drive to Herefordshire to see the Cream-coloured Corser but I didn't have any spare time available. So my twitching tends to be selective, depending on distance and how interesting the bird is. Some birds are more compelling to see than others. Ducks, for example, aren't high on my list of choices. I'm not sure why really, but for some reason I can't get that excited by them (unless it's a Harlequin I suppose). I've been lucky to have seen a Ferruginous Duck on my local patch some years back, literally a 15-minute walk from my house. Just as well really as I wouldn't want to drive far to see one. 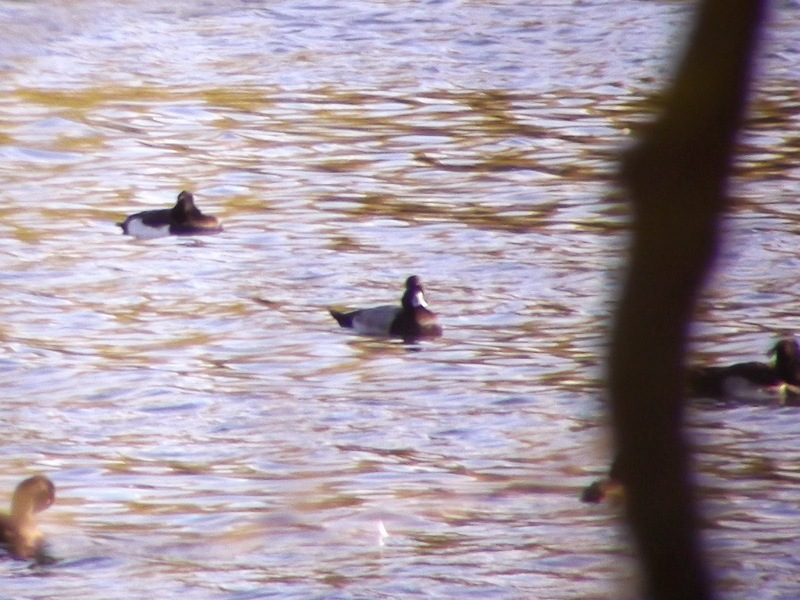 The Lesser Scaup is another rare duck I just haven't had the urge to travel any distance to see. There are regular sightings each year to the west of the country and in Wales, as well as in the north-west, but unless I happen to be in the area it will always be an omission. Then remarkably Chris Heard discovered a drake last Wednesday (while I was at the Daily Star) at Wraysbury GPs on the Sunnymeads pit. It was apparently a difficult bird to see due to viewing being restricted to peeking through gaps in a fence by the side of B376 just before the railway bridge. Saturday was unseasonably warm and another morning grabbed for a spot of birding, and seeing as Wraysbury is only 35 minutes away on a good run, it was the perfect opportunity to strike this duck off the non-wish list. Parking was a challenge, as all the roads in the area were private. I just couldn't be arsed driving over the bridge and walking back, so I parked about 50 yards up the road on the grass verge. A few other birders were present and indeed viewing was limited to gaps in the fence, and not helped by branches and tree trunks. But, despite the hindrances, after a few minutes the Lesser Scaup showed itself as it drifted passed from behind the mass of vegetation in the foreground, swimming among a large group of Tufted Ducks. It dived quite a bit, which meant we lost sight of it on occasions. 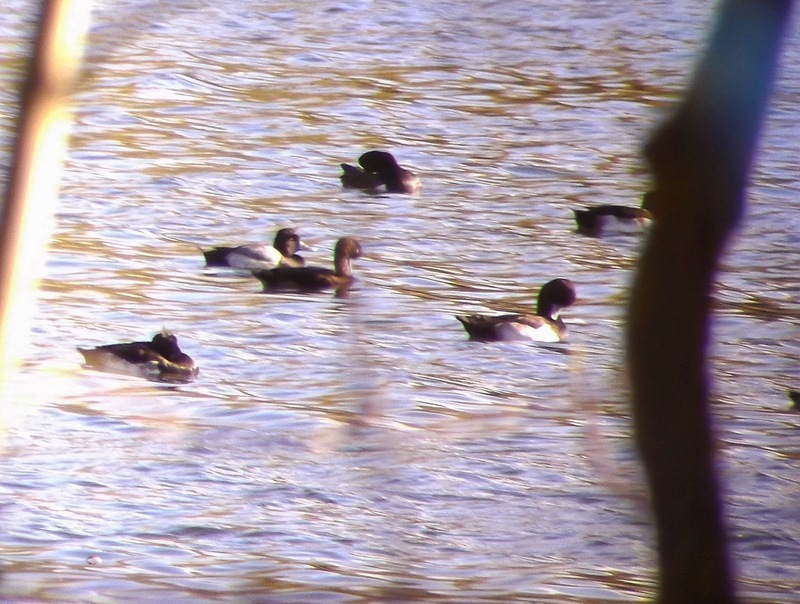 Even though it was in among these Tufties, the Lesser Scaup managed to disappear for a good 15 minutes here and there. Actually the challenge of getting a decent view made the experience that bit more interesting. A nice duck. What I found remarkable was how on earth Chris was able to discover this bird in such a difficult place to see birds. I don't know whether I would be bothered birding in this particular spot, let alone searching out for a possible rarity. An amazing effort. So on to Kent. I was visiting my parents in the afternoon, and had originally planned to drop in at Elmley Marshes to try to find the Long-eared Owl there, but I spent longer at Wraysbury than intended and had to go on to my next destination at Swalecliffe, near Whitstable. It's not a place I've visited before, but I was glad I did. 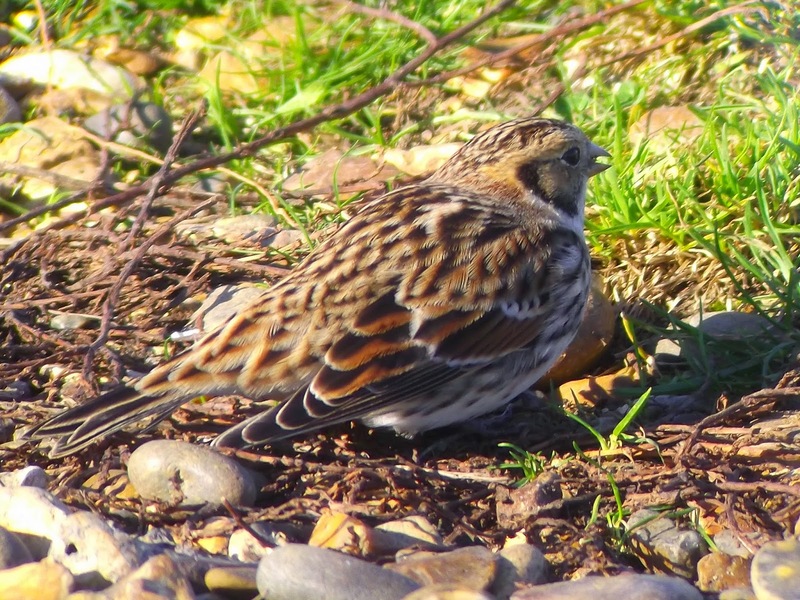 A short walk along the coastal path feeding in some loose shingle was a very engaging Lapland Bunting. 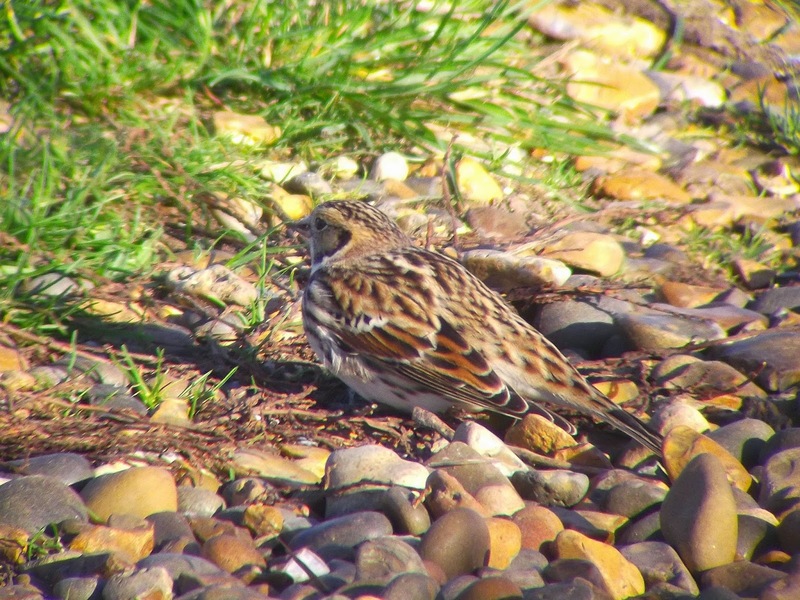 What a brilliant bird this was. 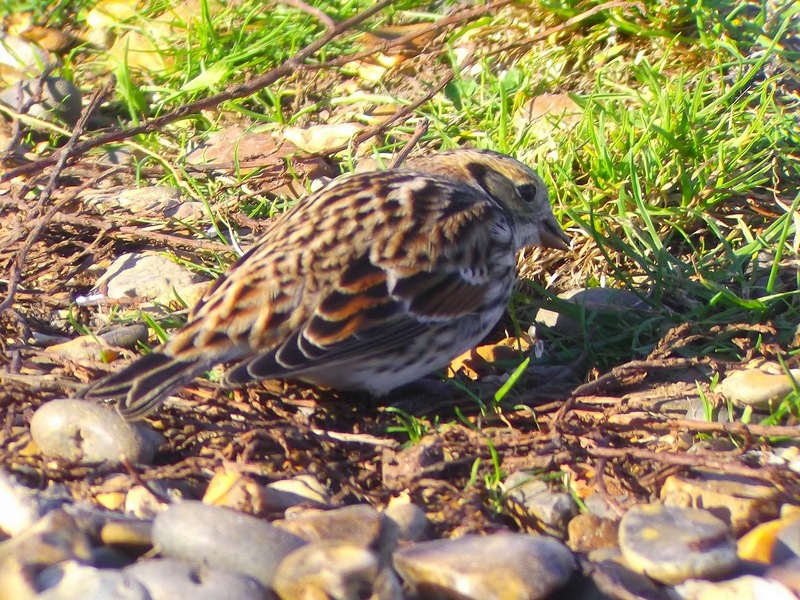 The path at 3pm was very busy with walkers, dog walkers and joggers, but this bold little bunting was not put off by all the human activity one bit. If a dog got too close he would fly a short distance away before flying back, or if a jogger disturbed him he would circle around the small group that had gathered, fly off about 25 yards further up the path before another dog walker would force him back to fly back to where he started. Remarkably tame and patient. He obviously likes that feeding spot as he is still there as I write this. If you are in the area in the morning I would serious consider paying a visit.